Make sure you are not caught unready, cast your vote and exercise your opinion on who the next government of Canada should be. The Fair Elections Act has changed how voting takes place in Canada, Indigenous leaders have expressed this law will make it more difficult to vote. 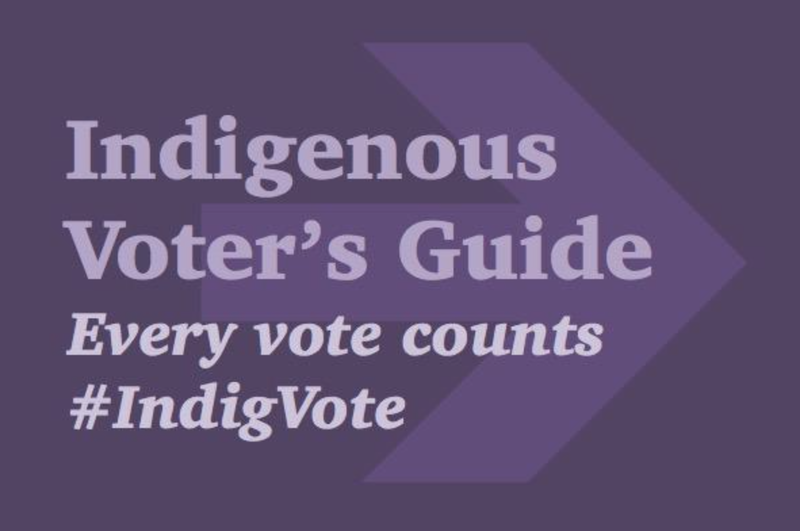 Our Indigenous Voter's Guide may help you overcome those barriers. 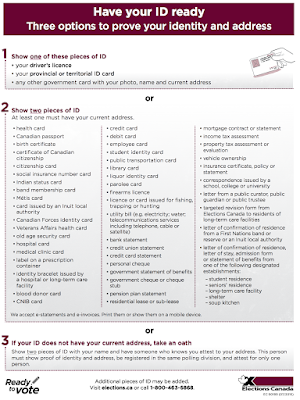 If you are unsure or want clarity of the process, contact toll free 1-800-463-6868 or visit their website: www.elections.ca. The official election date is Oct. 19, 2015, you may be thinking that you have plenty of time, now is the time to ensure you have what is required to cast your vote. Watch this quick overview "Get Ready to Vote"
The sooner you start this process the better. Checking if your registered, registering and ensuring you have the correct ID to vote (there are options) will help overcome challenges that could happen when you go to cast your vote. 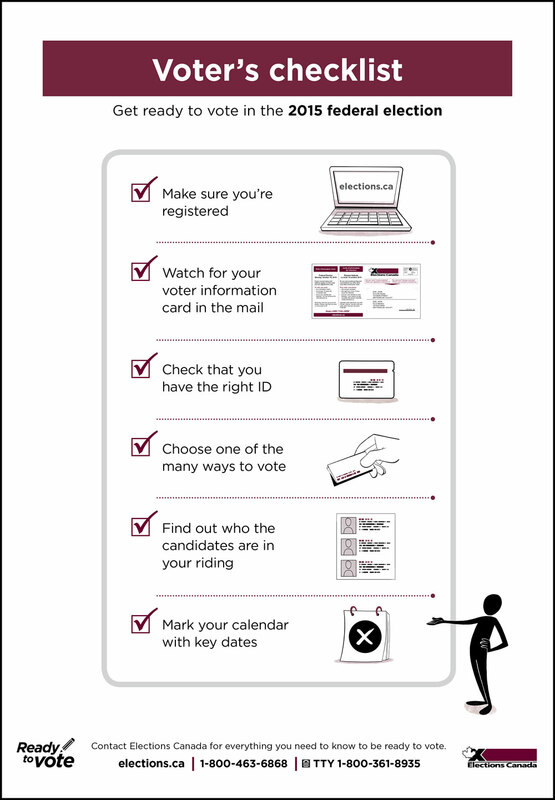 First step is to check if you are registered at your current address by visiting www.elections.ca/register, if you are registered early you will get a Voter Information Card in the mail that tells you where and when to vote. -Register online www.elections.ca/register and provide your Driver's License or Provincial/Territorial ID card. -Register by mail using the National Registration of Electors - Registration Request Form and mail back to Elections Canada or call 1-800-463-6868 to have a form mailed to you. Your local returning office will also have them available. -Bring completed form to your local returning office and remember to bring acceptable proof of identity and address with you. -You can find your local office through the Voter Information Service. 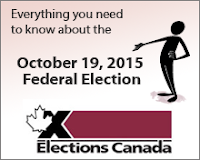 -Registration form must received by Elections Canada by 6PM, Tuesday, Oct.13. -Lastly you can register at your local polling station. There are three options, for the ID you will need to vote and register. With a completed Letter of Confirmation of Residence Form from a First Nations band or reserve or an Inuit local authority. This can also be written on the administration's letter head. This can be proof of address along with any other of the pieces of ID in this list. Here is a Letter of Confirmation of Residence (word template) designed by the Assembly of First Nations that band administrators can adept to their own use for their members. Note: Elections Canada accepts e-statements and e-invoices. Print them or show them on a mobile device. • Show two pieces of ID with your name and have someone who knows you attest to your address. This person must show proof of identity and address, be registered in the same polling division, and attest for only one person. Polls are open for 12 hours. If you're registered, you will get a voter information card by mail. It tells you when and where to vote. You should receive it by October 1. There are four advance voting days. Polls are open from noon to 8:00 p.m. Your voter information card tells you the address of your advance polling place. 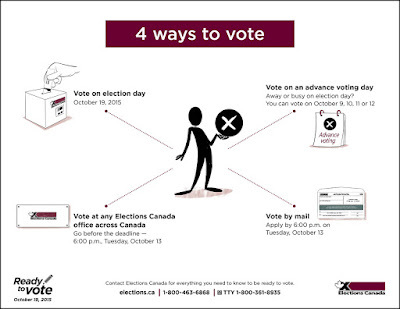 If you find it more convenient, you can vote at any Elections Canada office across Canada. Visit the office before the deadline of Tuesday, October 13 at 6:00 p.m. (local time) . Offices are open Monday to Friday from 9:00 a.m. to 9:00 p.m., Saturday from 9:00 a.m. to 6:00 p.m. and Sunday from noon to 4:00 p.m. Bring your proof of identity and address. Find the Elections Canada office nearest you. 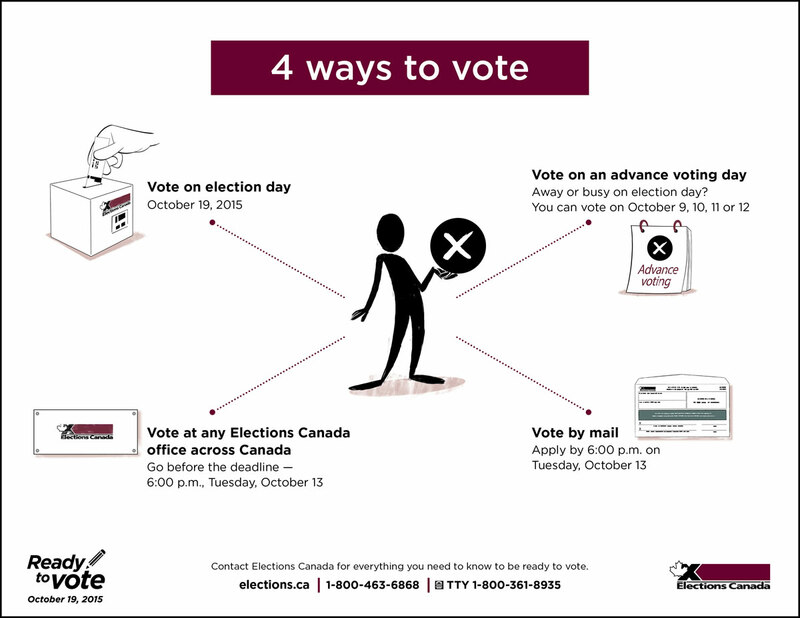 When you vote at an Elections Canada office, you use a special ballot voting kit – learn more. From October 5 to 8, Elections Canada is opening offices at several campuses, youth centres and Friendship Centres to help make the voting process more accessible. Check the list of where these offices will be located. If you will be travelling outside your riding, or if you find it more convenient, you can vote by mail – apply now. Apply as soon as possible, to allow time for your voting kit to reach you and for your marked ballot to reach Elections Canada by election day. The deadline to apply to vote by mail is Tuesday, October 13 at 6:00 p.m. Eastern Time for anyone applying online or sending their application to Elections Canada in Ottawa. Want to vote by mail but can't apply online? When you vote by mail, you use a special ballot voting kit – learn more. Elections Canada is opening offices at several campuses, youth centres and Friendship Centres to help make the voting process more accessible. Visit an office to register, vote and get information. Offices will be open from Monday, October 5 to Thursday, October 8. Anyone can use these offices, even if they are temporarily away from their riding (for example, an eligible voter who has moved to a new city to attend university or a student from a different campus). Voting will be by special ballot. Votes will count in the riding where the voter's home address is located. More information about Elections Canada offices at select campuses, Friendship Centres and community centres can be found here. 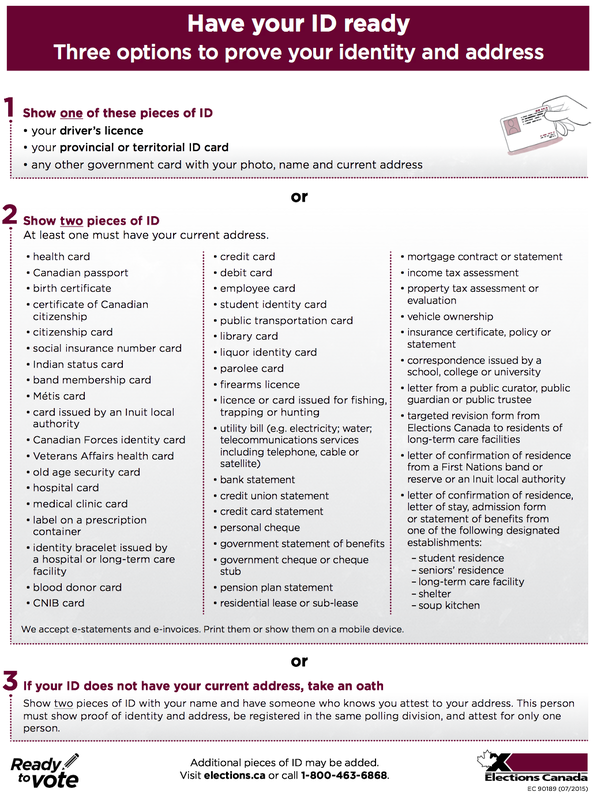 On voting day: Have your ID ready - Three options to prove your identity and address. Thank you to Election Canadas and the thousands of workers who will help us cast our vote and exercise our franchise. 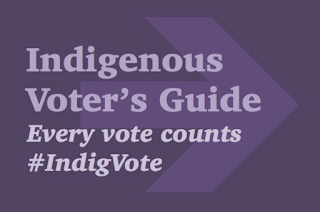 Link: Contact your Chief and Council to find out information on where the polling station will be on your First Nation. How First Nation, Metis and Inuit people can influence who is the next Prime Minister of Canada and if he/she has majority or minority government. IndigPoli compares Aboriginal population to Canadian citizen population as the percent of Aboriginal people in each the new 338 ridings based off of the 2011 Census NHS. Includes 38 ridings where the Aboriginal population is 10%+ or more of total population, 48 ridings where the Aboriginal population is 5%+ of total population. Then a riding-by-riding breakdown in each province of the Aboriginal population compared to Canadian citizen population. 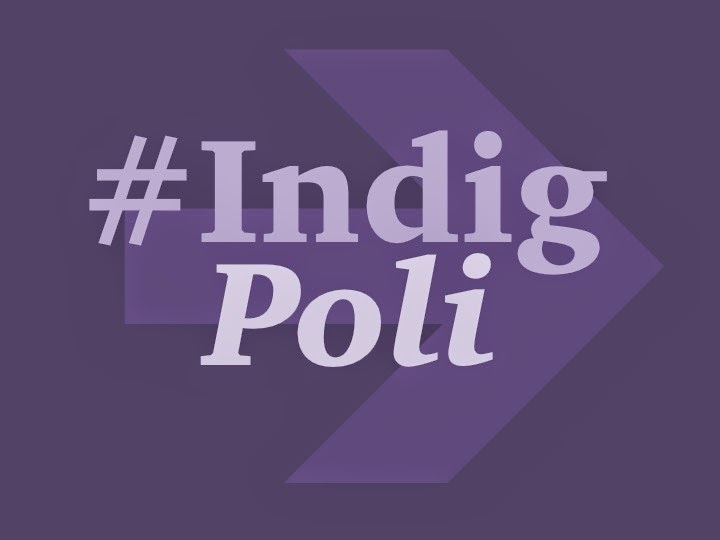 There has been thorough dialogue amongst Indigenous people on whether First Nation, Metis and Inuit people should be participating in mainstream Canadian election. By way of this blog and our social media activities, we are of the opinion that Indigenous people should vote and run as candidates for the various parties. The perfect example of the power of one vote was enacted by the late Elijah Harper. As a lone MLA in the Manitoba legislature, his actions would lead to the downfall of the Meech Lake Accord. The Meech Lake Accord's proposed constitutional amendments would have seen increased powers for Quebec and the provinces with little or no acknowledgment of Indigenous rights. Elijah Harper is a great example of why each and every vote counts. Eric Grenier who runs the poll aggregator and seat projection site ThreeHundredEight wrote in an article in the Globe and Mail that if there was a higher native voter turnout, we had the potential reduce the current majority government to a minority government. We can overcome the challenges and barriers to ensure that Indigenous people have the ability to exercise our right to vote and make that vote count. 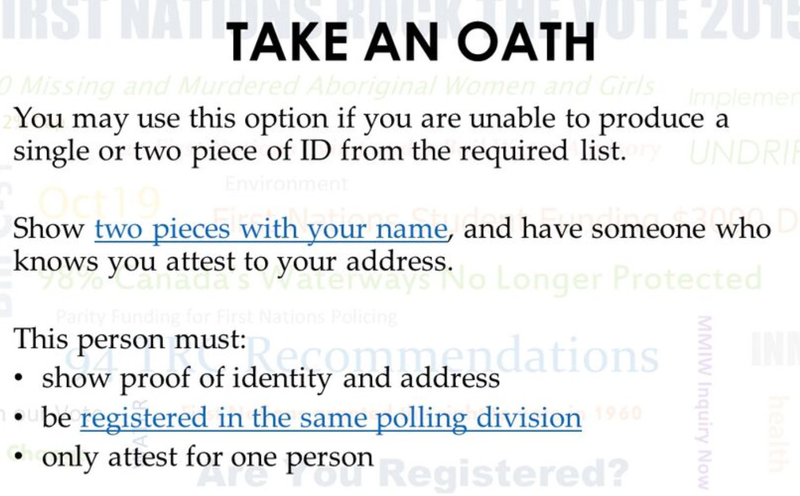 The recent "Fair" Elections Act has made it more difficult for Indigenous people to exercise their right to vote. Particularly as it relates registration, identification and access to polling stations. Below we will provide information and resources to assist with taking the steps leading up the election and finally casting your vote. Please feel free to contact us if you have additional information or comments, suggestions or corrections on the information that we have provided. Special thanks to Tania Cameron who helped with our first voting guide.